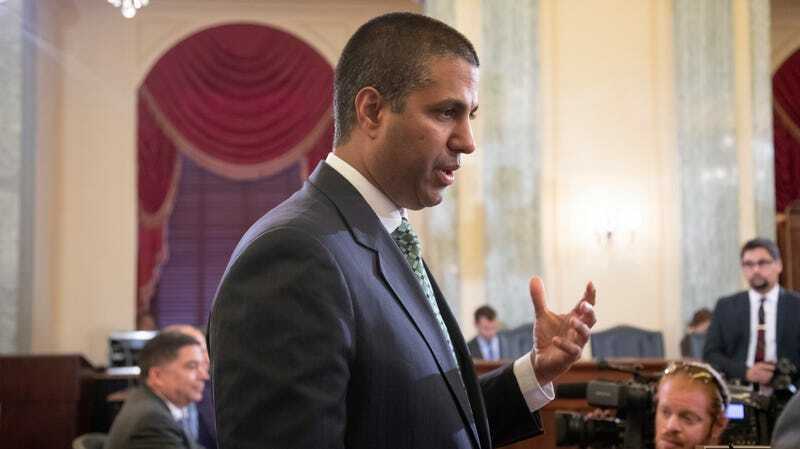 Federal Communications Commission chair Ajit Pai, the Donald Trump administration plant behind the repeal of net neutrality, is now very concerned about the neutrality of other tech companies. Last month, a conservative commentator took some of those same tweets, substituted a religious group for the racial category in order to, she argued, underscore the original tweets’ repugnance — and was promptly suspended. (To state the obvious, I do not support any of these tweets’ sentiments in any way.) After public backlash, Twitter rescinded the suspension, attributing it to an “error.” But how was the suspension decision made? Was it by an algorithm or a human? How was the reversal decision made? I pointed out that many content creators on Google’s YouTube platform, like PragerU, said their videos were “demonetized” — that is, denied advertising revenue critical to their ability to speak online — without explanation. And many Twitter users said their online messages were restricted without explanation, such as Tennessee Congresswoman Marsha Blackburn’s video announcing her campaign for the U.S. Senate and one company’s statement on net neutrality (ironically, on a day advocating about the importance of net neutrality). In fairness, Pai does also make some good points, noting that companies like Google and Facebook control mind-blowing amounts of user data and regularly share it with other entities without users’ knowledge. He also called out Google and Apple for collaborating with Chinese government censors, which he accurately pointed out were “practices [that] would never be countenanced at home.” And it’s pretty hard to deny how unsettling it is that these massive tech companies have zero accountability. But all in all, this seems like an attempt to hit two birds with one stone. The first bird is deflecting from his repeal of net neutrality regulations to point the finger at other tech companies as the real threat to online freedom. (Never mind that repealing the rules allows service providers to impose their own arbitrary, profit-minded restrictions on what users can see or do online, including throttling, outright censorship, or simply strong-arming rivals out of business.) The other bird is advancing bad-faith claims that tech companies are censoring conservatives while letting liberals run rampant, which is really just a pretext for demanding favorable treatment under the guise of fairness. Cries of liberal bias by right-wingers too often causes mainstream media outlets to overcompensate and provide disproportionate coverage to conservative viewpoints. It’s a playbook that the conservatives have been using against the news media for decades and now they’re deploying it against social media companies. Their aim is clear: game the refs and rig the system in their own favor. Pai’s FCC regulates telecoms, not content, so there’s not much he can do about this personally. But people across the ideological spectrum are increasingly skeptical about companies like Facebook or Google, whether that entails supporting breaking them up or more ominous calls for some kind of punitive regulation from Trump administration officials and Fox News types. If “new transparency obligations” or something else are on the table, it’s worth being very wary about who is proposing them and what they do.